Heart disease continues to be the number one killer in America, and a person with heart disease has a more difficult time fighting off infections and viruses. This is why it’s so important to stay up to date with your vaccinations, as they help your body fight off preventable illnesses. Without vaccinations, a person with heart disease is at a higher risk of cardiovascular complications. Therefore, vaccinations are a good way to help reduce these complications and even reduce the risk of death. The flu, in particular, can have adverse effects on heart disease patients and their risk of death is much higher. The annual flu shot is an effortless and readily-available way to keep the flu at bay. Other studies have shown that the pneumococcal vaccine is associated with a lower risk of acute coronary syndrome. Diphtheria is a bacterial infection that can lead to myocarditis – damage to the heart muscle – so receiving the Tdap vaccine can help reduce this risk. Heart disease patients who develop herpes zoster (chicken pox and shingles) are at a much higher risk of stroke and heart attack. 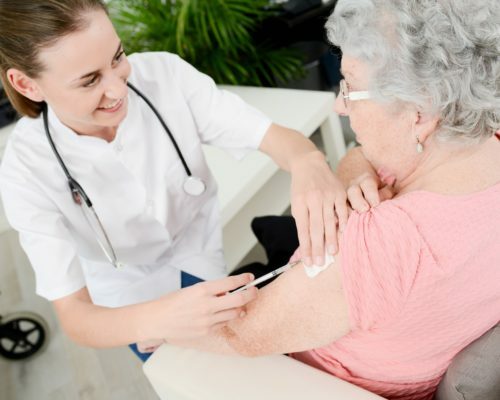 The two-part vaccine for herpes zoster should be administered to those over the age of 50. Many people don’t get vaccinated due to misconceptions or wrong information. But these vaccines are safe and encouraged as a means of not only reducing your risk of the particular illness they’re made for, but they also protect your heart. If you’re unsure of what vaccines you’re missing, speak to your doctor. If you have any questions about vaccines, your doctor can help provide you with answers.